Location | | RSB Designs Co. Creating one-of-a-kind original, wearable art. 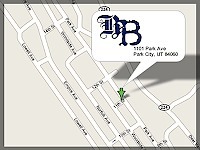 Established in 1988, RSB Designs is located in the historic district of Park City, Utah, RSB's showroom is in the same building that once housed an old-fashioned general store run by Ron’s grandparents. Specializing in original designs and retail jewelry, RSB Designs caters to the unique desires and ideas of each client, with an emphasis on original, wearable art, including handcrafted rings, pendants, bracelets, earrings and necklaces.